What's in the SWAG BOX?! Each month your subscription SWAGBox is carefully and prayerfully pack with love, and 6-8 unique Christian items from Christian companies such as books, jewelry, accessories, music and apparel. 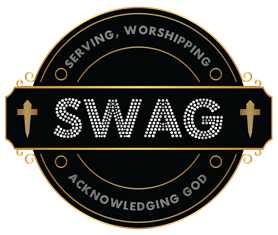 All items are selected to help you grow in your faith, share with others, display your believe and to truly take your SWAG to a higher level. All SWAG Boxes are delivered the first week of each month.